In a large bowl, place the rice noodles and cover with boiling water and allow to stand for 10 minutes. Drain and set aside. Using a frypan, add the soy, 1 cup water, ginger, garlic, sugar and honey and stir well to combine. Simmer over a low heat for 3 minutes, stirring occasionally. In a jug, combine the corn flour and 1/4 water and stir until no lumps are visible. Stir through the sauce and whisk until thickened, approximately 2 minutes. Remove half of the sauce and pour it into a sterilised air tight container. Place into the fridge for up to 3 months. Place the carrot and corn into the saucepan with the remaining sauce and allow to simmer for 2 minutes. 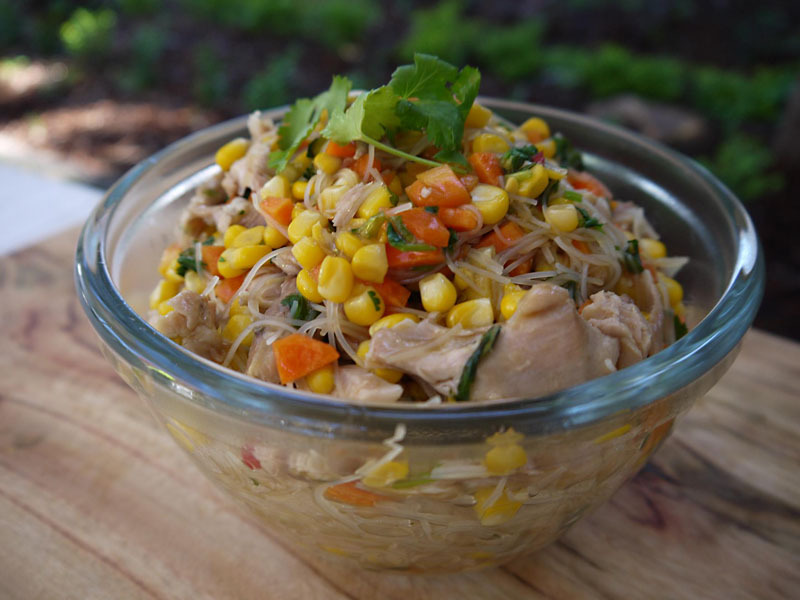 Pour over the noodles and stir through the shredded, poached chicken. Garnish with chopped coriander leaves.